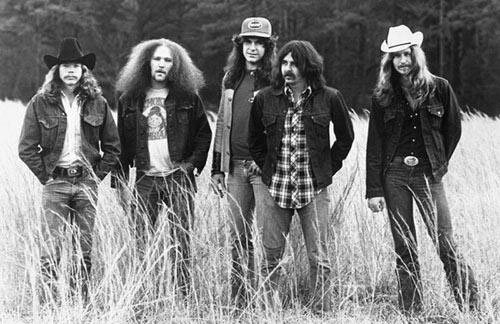 The Outlaws are another southern rock band that while never as big as Allman Brothers and some others had a few big hits and made an impression on listeners. The second rock band by this name (previously Ritchie Blackmore had a band with the name Outlaws in England), it was formed in 1967 in Florida by a group of friends. Their first hit "There goes another love song" wasn't until 1975 when Lynyrd Skynrd producer Clive Davis after seeing them in a show with Ronnie Van Zandt, who told his producer "If you don’t sign the Outlaws, you’re the dumbest music person I’ve ever met." On that same album was the song "Green Grass and High Tides," one of those southern rock anthems that is so powerful you remember it even if you don't know who sang it or what it came from. Reading the lyrics is a bit confusing, and many people think the song is about drugs. The title is taken from the Rolling Stones' first greatest hits disk Big Hits (High Tides and Green Grass) but it is not about drugs any more than the Rolling Stones title (the green grass is the stuff on the other side of the fence, not in the rolling papers, and the high tides is the stuff that rises all boats). "Green Grass and High Tides" is about singers and musicians who had died and the place you can still go in your music to enjoy their work and hear them still. The kings and queens refers primarily to Jimi Hendrix and Janis Joplin who inexplicably is held in high regard by hippies despite her limited talents in singing and short career. The song crafts this image in poetic images such as silver stages and rainbows around the sun, and some of the lines are a bit too hippified to believe they came from southern boys (but you have to remember, southern rock came from long haired dope smoking hippie southerners), but the overall message is clear once you have an idea what they're talking about. Starting out with a single guitar riff that builds and builds as the song grows in power, the whole song is over nine minutes long, but its so good and has such a great guitar solo in it you just don't care. The lyrics blend in to the song so well that the singers almost become another instrument; what they're saying isn't nearly as important as the song its self. And ultimately, that's the best tribute you can give fallen musicians. Will you let me past your face to see what's really you? This is part of the Songs I Like series.